DBX to PST Converter is a trustworthy solution to convert DBX files to PST, MBOX, MSG and EML without installation of MS Outlook. 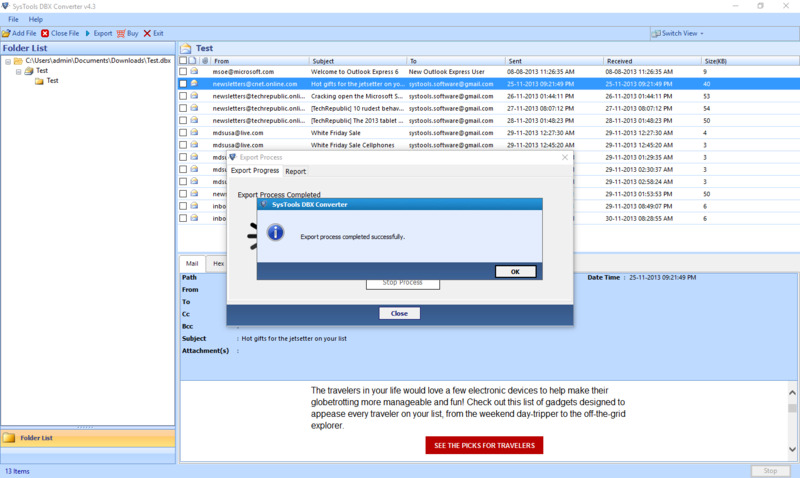 The tool is equipped with advanced features and can auto detect the storage location of DBX files of Outlook Express. 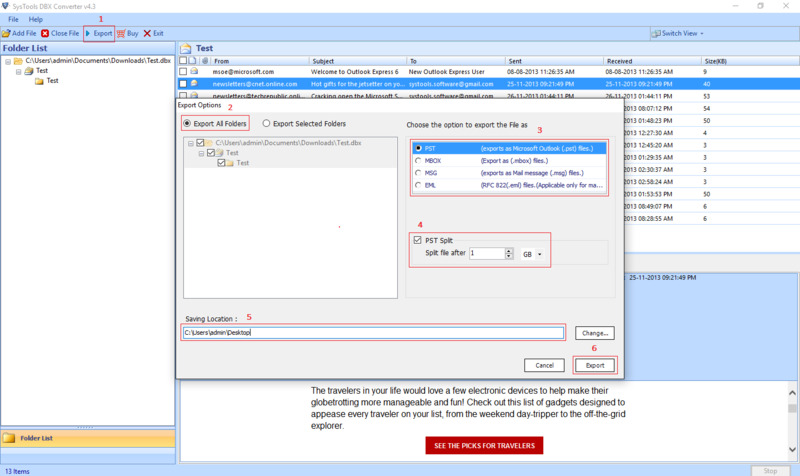 Export DBX files in three different formats i.e., PST, MBOX, MSG and EML. Option to import DBX files or folders in different formats in batch. Allows previewing of email attachments such as documents, images etc. Detects the storage location of DBX files and folders automatically. Can preview emails in different styles like normal, hex view etc. Option to split large size PST files into smaller files up to 45 GB. Desired naming convention can be applied to manage resultant. Selective files and folders can be converted from DBX to PST, MSG & EML. Scans multiple DBX files and generate a status report showing item count. 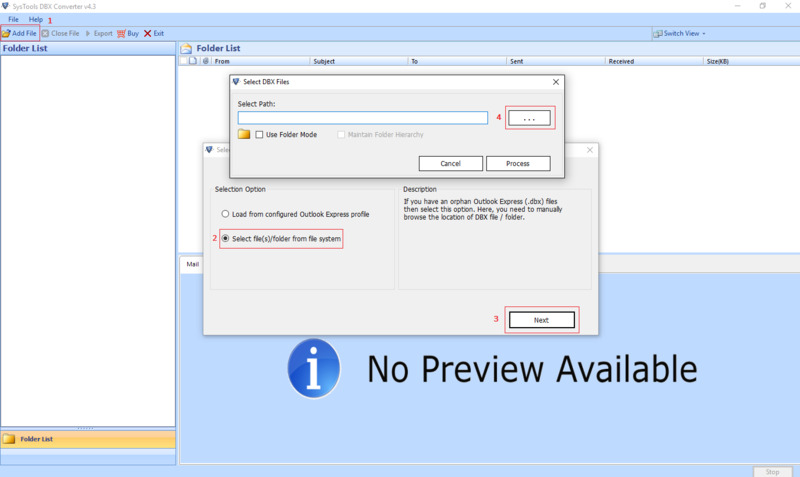 Option to save the resultant file in a new folder from the software panel. DBX to PST Converter demo version export 25 Items/folder. Microsoft Outlook Express is an email client that saves files with .dbx extensions. These files include email folders that are created by Outlook Express. 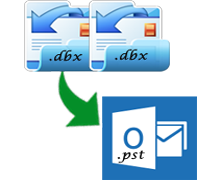 The email messages which are stored by Outlook Express in definite mailboxes are contained in DBX folders.PST files are used in order to store data of MS Outlook. The PST files uses fixed block based allocation scheme. New technologies are being developed and are accepted worldwide. Slowly Outlook Express is getting outmoded and is replaced by Outlook. The major reasons due to which Outlook Express is considered as outdated is the security concern and better email management at enterprise level in Outlook. Modifications had been done in Outlook Express but yet it is not up to the satisfaction of the users. Due to high security and large file size of PST files people prefer to use Outlook. Thus DBX to PST converter tool is in demand. If users also want to migrate all these DBX to MBOX, Thunderbird, Entourage, Mac Mail, Eudora, Evolution, Mail Copa, Berkeley, The Bat, etc. Does the tool support for bulk conversion of DBX files into PST file format? Yes, the software can convert unlimited DBX files into PST file format at a time. I have some corrupted DBX files, can the software convert those files into PST file format? No, the application clearly doesn't support for corrupted DBX files. So, you have to bring the files to healthy state in order to convert them. Is the folders structure of the DBX file going to be lost during the conversion process? The entire folder structure will remain the same even after the conversion. There will be no change at all except all the files will be in PST file format. Does the software requires installation of Outlook for the conversion process? No, the software doesn't require the installation of Outlook for carrying out the conversion process. However, one needs to install Outlook in order to view the files. Is there any limit for migration of DBX to MBOX format? "The tool has exceptional working. I am really happy to come across this software. Besides converting the DBX files to PST format, it also helps in managing the over-sized PST files in order to avoid PST file corruption." "I was in a real dilemma for how to convert the DBX files to Outlook PST but then I came across your wonderful solution. It has rendered me a safe conversion technique .Great job!" "One of the best attributed features of this utility is that it allowed me for batch conversion of all the DBX files into PST file format. Awesome operability!"